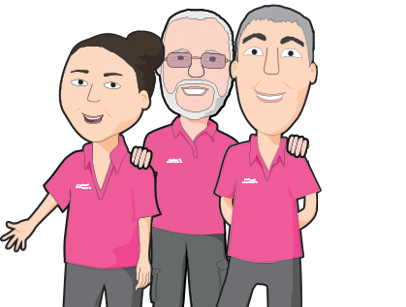 The Family Team consists of Dave the Dad and his siblings brother & sister John & Jo, also on board is our full time engineer, Chris who is has known the family since john and himself met at play group over 40yrs ago! And on occasions you will find Mum Jean who is the peacekeeper, chief tea maker and secretly rules the roost. Behind the scenes and what secretly holds the business together especially when we work 24/7 in the summer months is Johns Wife Andria and his three children, Jake, Erin & Elsi, they are all very patient when John is late home time and time again. And there’s Jo’s Partner Simon, who when is not doing his own job “geology engineering” around the world, helps maintain the premises and keep Jo Sane. The business was originally set up in February 2009 by Dave Grove (Father) one man in a van mobile caravan repair business, but the business soon grew and Dave wanted to focus more on his mobile caravan servicing and repair business. His daughter Jo, stepped in to learn the ropes and took the business over in Sept 2009. Jo decided that for the business to provide a better service to caravanners, the accessories shop would have to be extended, so after building a new shop in the depths of the winter, Jo, then convinced her Brother John to come on board and take over the servicing side of the business the family were very proud to open their new caravan accessories shop in April 2010. Since then we have taken over the whole yard including two work shop. Watch this space for more updates!!!! The business is now growing from strength to strength. As it’s a business that we are committed to and have put our heart and soul into. We pride ourselves on our friendly approachable service and have built the business up on reputation. Our moto is “We are large enough to cope but small enough to care”. Our aim is to get people on a small budget into caravanning and pride ourselves on being what we think the best and friendliest place to come if you are a caravanning novice to meet our friendly non intimidating sales team. To give customers that additional special attention in making them welcome on arrival at our premises. To offer all visitors the best information on arrival.